This is a speaking activity to be used with Violetta´s fans. Violetta is a well known TV-series from Disney Channel. 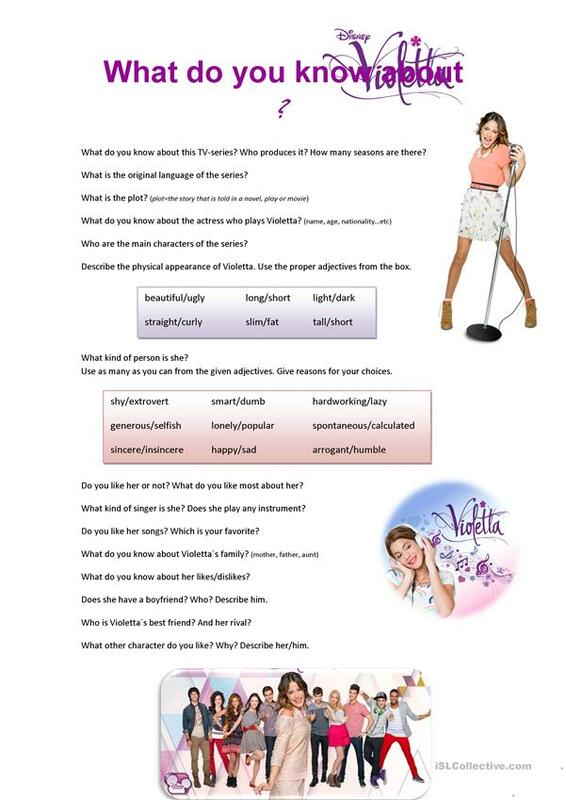 I used these questions to make my students speak as much as they could, and depending on their answers, I made additional questions (for example we talked about favorite episodes, Violetta´s concerts etc). We spent almost 45 minutes talking about it, and it was a big success. I hope it helps! The above downloadable teaching material is a great resource for high school students and elementary school students at Elementary (A1), Pre-intermediate (A2), Intermediate (B1) and Upper-intermediate (B2) level. It is excellent for improving your class' Speaking skills.